8.24 points at 29 votes (rank 48). Due to the scarcity of raw materials on Earth, they try to gain resources on the moon Titan. But there is a hostile climate. As no human is able to work in this surrounding, a life form should be created, which does not get harmed by these conditons. The "Prometheus" - a research ship which contains the most modern genetic engineering lab named "Firestart Labs" - is sent towards Saturn. The researches finally succeed in creating the desired creature. After further research several prototypes are generated. But suddenly the radio contact to the "Prometheus" is cut. As already great heaps of money had been invested in this project, the government wants to solve this incident. Therefore it sends their best agent, Jon Hawking, to the "Prometheus". He is instructed to re-establish the contact to Earth or at least to secure the result of the researches. My name is Hawking, Jon Hawking. 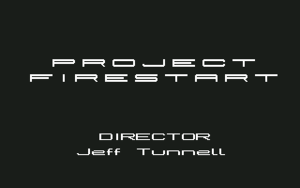 Chief Ricker has just acquainted me with the top-secret-info about the Firestart Project and its results. As S. I. agent I have now the mission to fly to the Prometheus, find a video tape about the genetic experiments and after activating the self destruction mechanism make a bolt for it as fast as possible. At the latest after two hours I have to contact Earth, otherwise the Prometheus will be destroyed with me by remote control. Nice prospects – I love this type of missions. So, there is no time to lose, let’s start. After a short intro (to view the full prelude you have to be a bit patient, it follows after the ticker), the game starts in the airlock of the research ship. The player takes over the role of the agent now. "Project Firestart" is a typical action-adventure, you steer a figure through the different rooms, have to look permanently for the weapon and ammunition supply, solve puzzles, take care of the wounds, find hints in the shape of computer logs and are coping with everything on your own. After a short time the player meets the first genetic mutants and they prove to be very resistant against the own laser fire . . . Scary mood as in "Aliens" arises on the domestic monitor. Dense atmosphere, good graphics (only the scrolling judders a bit), fluent animations and fitting sound make shiver send down the player's spine. If you are not disturbed by detailled graphics of monster victims and have no sensitive soul, you can look forward to a sophisticated action-adventure with a well-thought plot and surprising twists in the story. With the joystick you determine your moving direction and the shooting direction of your laser. Simply press the stick into the direction into which you want to go or shoot and press the fire button to release the weapon. If questions as e.g. "Open Door? ", "Close Door? ", "Use Elevator? ", are shown, use the joystick to choose and press the fire button to confirm. This command shows the type and the energy level of your weapons. It also shows all other items that you carry. With this command you can (if you carry more than one weapon) swap your weapons if the active weapon has only little or no energy. The submenu appears with the commands "Format", "Save", "Load" and "Restart". Format - prepares a disk to be used with the save command. To format a disk, remove the game disk from the drive and insert a new disk. Caution! During this process all data on the disk will be erased. Save - With this command you can save the status of the game at any time. Up to five game statuses can be saved on a disk previously prepared with the "Format" command. Load - With this command you can load a previously saved game status (with the command "Save") any time and continue playing. Restart - Aborts the current game and allows you to restart. Arrows on the ground show doors, that cannot be seen due to the perspective design. Health: The health status can be improved through first-aid kits. Loading status of the laser: The current laser status is always shown. Time and countdown: After the self-destruction has been activated, the countdown is shown here. Joystick icon: It is shown when the joystick is active, i.e. when no cut scenes are shown. Text line: It is at the lower rim of the screen. Here questions, conversations, messages and the inventory are displayed. You cannot carry more than two lasers at the same time. Lasers are always active only against one target. You cannot run and use the laser at the same time. You cannot put away a laser or change it as long as it still contains energy. The health status can be improved through first-aid kits. Search all bodies, although this is a bloody issue. You will find important items there. To search a body (or terminals, weapon cupboards, etc.) stand as close as possible next to it. In the text line will be displayed what you have found. Find the radio terminal and stay in contact with your base. If you do not get in touch, it can happen that your death is assumed. Find the access terminals for the onboard computer. You can get important information over it, which you will not find anywhere else. Mutants turn out to be resistant against laser fire - you have to hit them four to five times, before they meet their maker! So at the start you should better go and search for a more effective weapon. As you can only carry two lasers at the same time, the second recommended weapon is a plasma laser. In the "Med-Lab" there is an energizer that brings back lost health points (works more than once in contrast to the first-aid kits). During his mission Hawking finds out, that there er still survivors: Marry, who is in cold sleep and who you need to rescue, and the intransparent Annar - he emerges as traitor and sabotages the different facilites of the Prometheus. The aim of the adventure is to find the video tape with the scientific material, rescue a woman named Marry and leave the Prometheus yourself before the self-destruction is triggered. There are different ways of solving the game. Walkthroughs and maps can found on the C64Games.de website and in the "links section"
The longplay video by Reinhard Klinksiek is also utterly worth seeing see section "videos"
The version by "Nostalgia" offers different trainers and also the possibility to play the game with a 1581 drive without disk change. Since 15.01.2012 you can also find a version for the EasyFlash cartridge (see "links"). H.T.W: "This is one of the few games, which already captivate you while watching the prologue. The very nicely painted graphics and the adequate soundscape add to this effect. 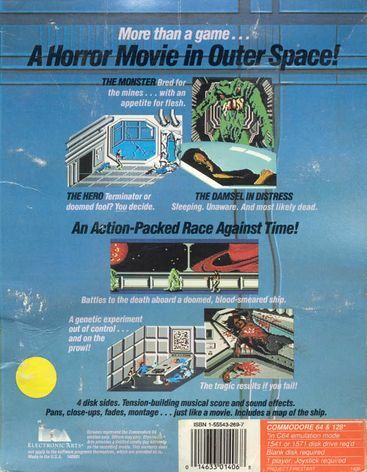 The following search for information is at the beginning without any problems - also due to the easily understandable controls - but after a short time you do not only have to defend yourself against genetic mutants but also keep an eye on the time limit which is given due to the peril of self-destruction of the Prometheus. Furthermore the story adds additional suspense to the game in the further course. E.g. a woman previously in cold sleep awakes and is too weak to rescue herself, the main reactor is switched off at the most inappropriate time and it gets pitch-black, a monster of the second generation hatches, a scientist weaves a web of intrigues and finally wants to kill you when you thought you were rescued. Conclusion: A horror action-adventure of the top class with cut scenes, surprising twists in the story, tricky puzzles, scary atmosphere and slight borrowing from the film "Alien" which could not be better and is absolutely recommendable." 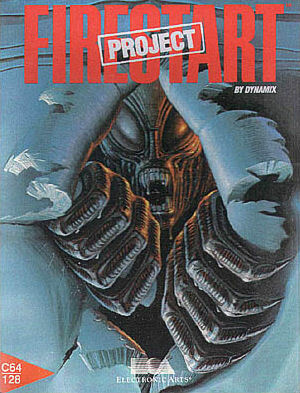 "Project Firestart" was only released for the C64. Despite the great success and the big praise of the critics the game was not converted to other systems. This action-adventure reminds of the movie "Aliens" concerning the plot and concerning the gameplay of "Resident Evil". This page was last modified on 14 June 2016, at 19:30.